When you want falafel, you want falafel, and you don’t want to run to the grocery store and get dried chickpeas then wait at least 12 hours for them to soak. That’s why the first “falafel” recipe I published on NCK isn’t exactly authentic. Like many of the versions floating around the internet right now, it’s made with cooked canned chickpeas for speed’s sake. At the time, I was nervous that if I revealed the truth about authentic falafel and the soaking time involved, y’all would skip over the recipe and miss out on the best homemade falafel experience of your life. Back up for a second, though. How did I become such a falafel snob when six years ago I didn’t even know what it was??? Had I known that weird, foreign-sounding falafel were in fact just fried (vegan!) chickpea fritters with a crispy, batter-free exterior, I would have hopped on that train much earlier. Earlier than the Saturday night out when, at 1 AM, I found myself devouring the falafel sandwich that somehow made it’s way into my hands. At least I think that’s how it went, although it might have been something like 10:30 PM, and things were definitely not as wild as you might envision. Shortly after, I set to work trying the falafel recipe from Joy of Cooking, surprised to learn the internet had deluded me into thinking that I could achieve crispy, perfect falafel texture in 30 minutes using basically just a can opener. It’s not possible: there is just too much moisture in cooked chickpeas to achieve authentic falafel texture. I stand behind my previous (inauthentic) quick baked falafel recipe, but sometimes it’s worth a little extra effort and time for the real deal. It’s up to you. Here’s a shot of the first fried authentic falafel I made. Clearly, if they looked this good on my first attempt, you know it’s not that tough. Next thing you know, I’m seeking out falafel at every opportunity, including the catered lunch in the office at my previous accounting gig. I fell in love with one particular salad, a few years back, that inspired this lentil and mini falafel salad recipe. Everything about it was a little weak–sad lettuce, out-of-season tomatoes, mushy lentils–except the three giant falafel balls that stood like big vegan meatballs on top of the salad, waiting for me to bite into the crispy fluffy goodness. Even after they had been in a delivery bag for lord knows how long, they still satisfied my craving, reinforcing the important point that you don’t have to make these mini falafel fresh just before eating the salad. 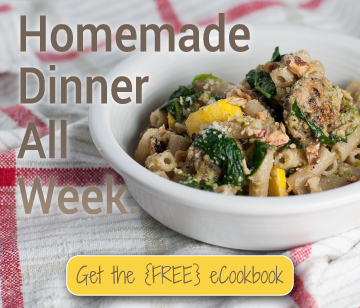 I’d encourage you to make a big batch, maybe even a double, and keep them in the fridge all week, atop already assembled salads with a simple, healthy dressing. Now that’s a work lunch to look forward to. Besides the lackluster produce, I found that typical size falafel are a little unwieldy in this salad. It’s hard to get a bit of falafel in every bite when you must cut them into ten pieces each. Way too much work. Mini falafel, about half of the normal size, are so much easier to handle, and you get way more of them on your salad, which helps me resist the urge to go back and eat the entire tray. Also, to get really mathematical, the crispy exterior to fluffy interior ratio is higher when you form smaller falafel, so you get more of that browned crunch on the outside. Oh, and about that produce. I easily upgraded the rest of the salad with hand-chopped fresh veggies, which can be switched out for whatever happens to be in season. Bell peppers would be a welcome addition, complementing the flavor and bright color of the roasted pepper tahini dressing I made to top the salad. It’s a major boost from the little cup of oil and vinegar that came on the side of my restaurant salad, super creamy but, yes, still vegan. 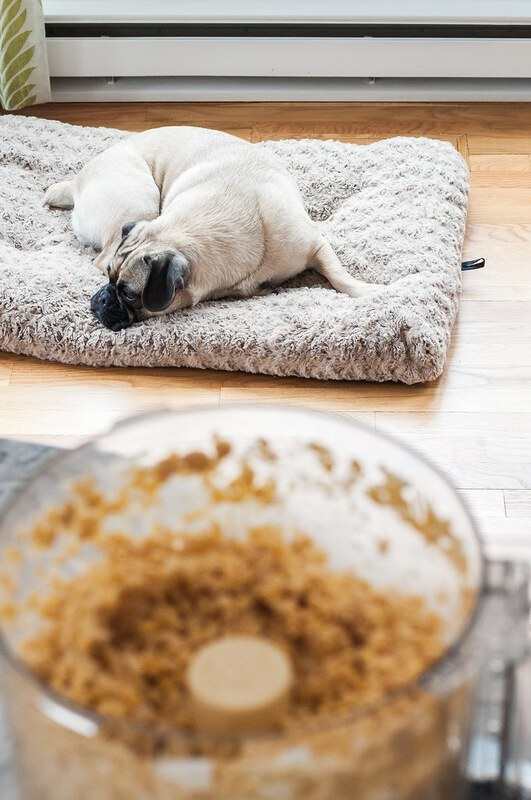 I like to cook my own lentils, easily made ahead and served cold, so I can control the cook time and, consequently, avoid a gross looking pile of lentil mush. I used Trader Joe’s small green lentils in the photos, but French green lentils would be fantastic as well. 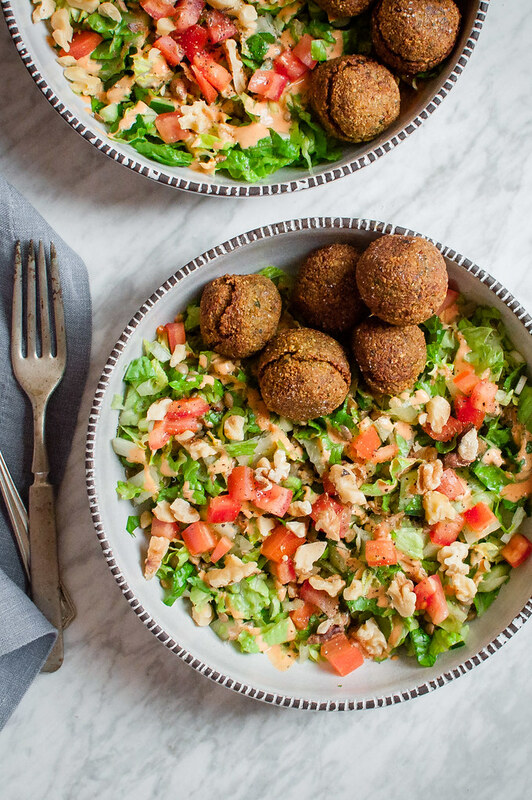 Whether you’re a falafel newbie or an old pro/addict, I’d be delighted if you step out of the 30-minute-meal zone and into the falafel-to-die-for zone, even if it’s an exception to your usual routine. 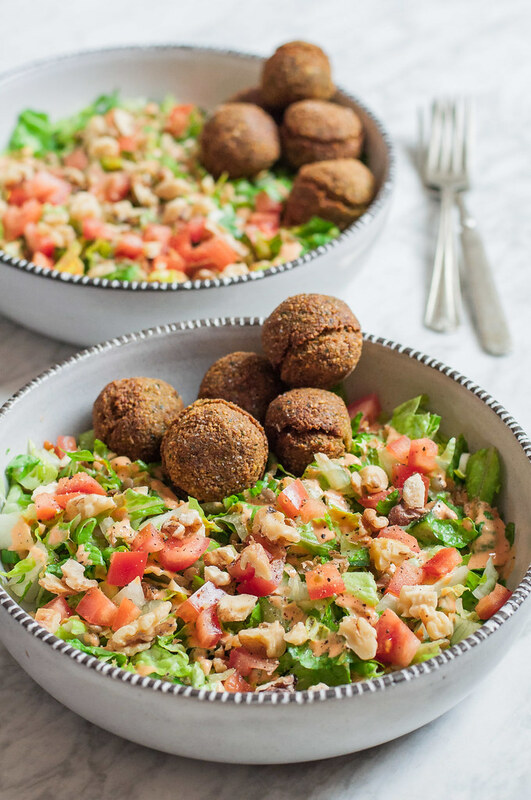 I think you’ll find that falafel salad is only just the beginning, and I already have another post or two in mind with fun recipes to use the healthiest fritter ever created. 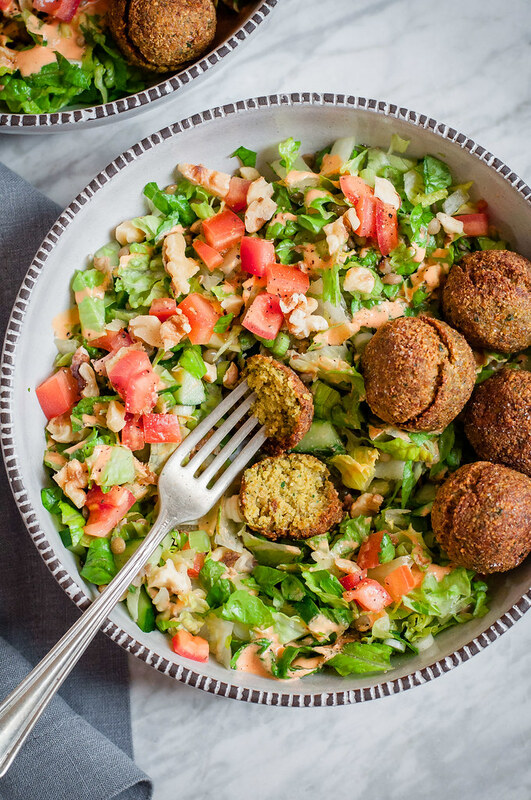 Inspired by the take out salad I ordered frequently in my corporate accounting days, it's hard to believe this fun, filling salad topped with bite-sized falafel is vegan and nearly gluten free. 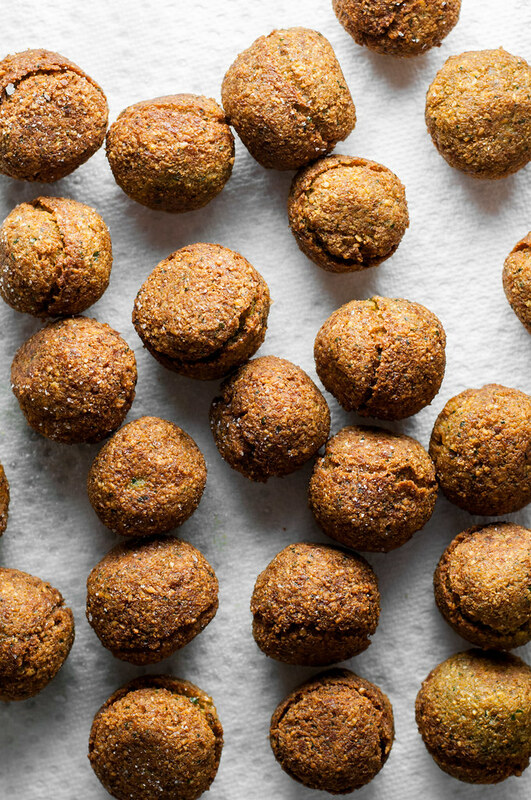 The falafel are shallow fried and much easier than you probably imagine, conducive to making ahead, and a colorful three-ingredient tahini dressing tops it off. 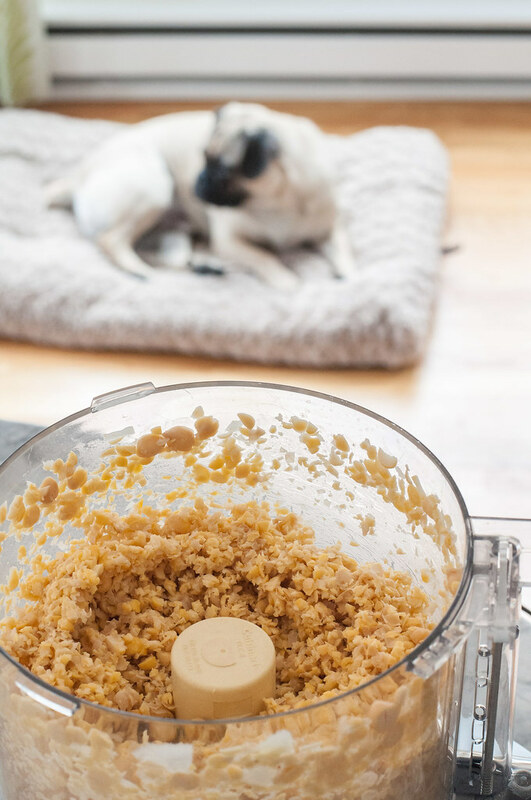 Finely chop chickpeas in a food processor by pulsing and scraping down sides as needed. To the processor, add onion, fresh herbs, garlic, baking soda, dry spices, and 1¼ teaspoon salt. Process until everything comes together into a grainy dough. 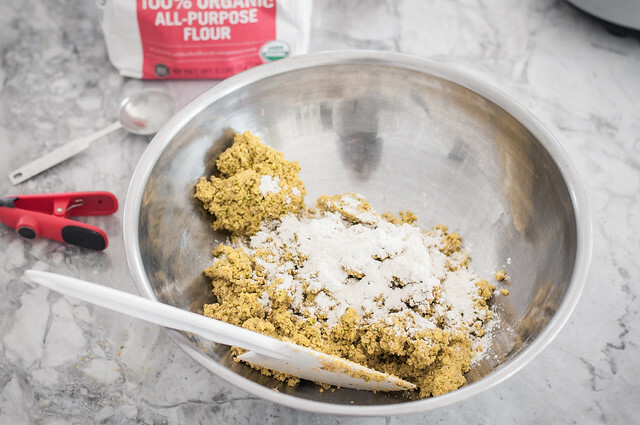 Empty into a bowl and stir in the flour, then press plastic wrap over the surface of the dough and refrigerate at least 15 minutes (up to several hours). 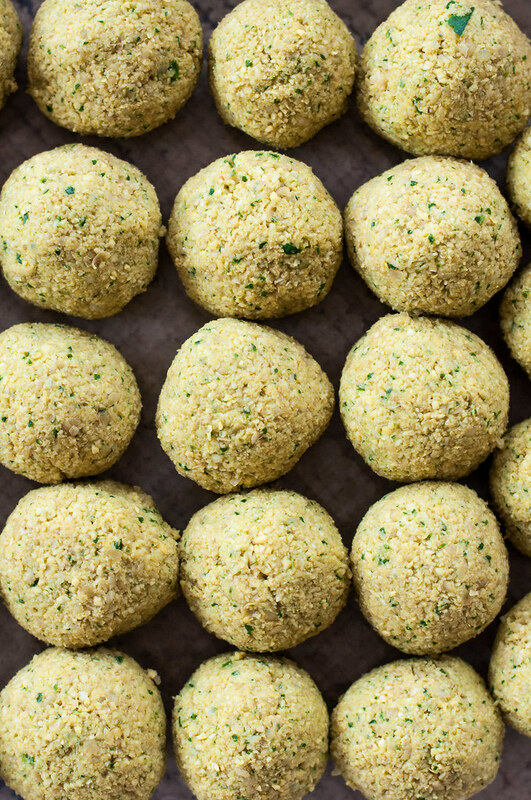 Turn falafel dough onto a work surface, flatten into a thick disc, and divide into quarters. Form a disc from each quarter (this helps to end up with equal sized falafel) and divide each into sixths. Roll each portion (24 total) into a ball (about 1¼" diameter) and place on a plate or baking tray covered with wax paper. You can refrigerate the balls at this stage, covered with plastic wrap, for an hour or two. Fill a 10 to 12 inch heavy skillet with ½" of oil (you may have some oil left over). Heat gradually to just over medium heat, or 365 degrees (F). Gently lower 6 to 8 falafel into the pan: they should bubble moderately, and you may need to increase heat slightly to maintain the correct temp. 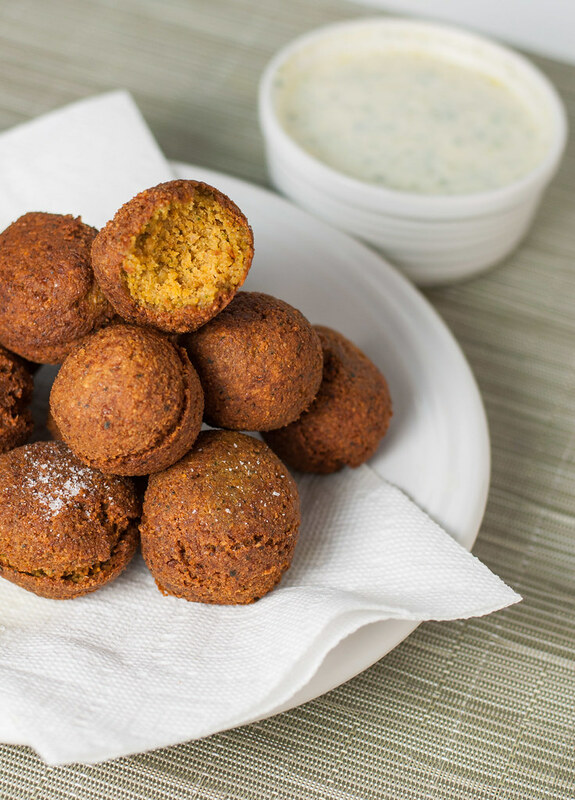 Fry falafel for 2 to 3 minutes, then roll them to the other side with a wooden spoon and fry another 2 to 3 minutes. Remove to paper towels or a wire rack and sprinkle with salt. Fry remaining falafel in batches until done. They're just fine served at room temperature, but to keep warm, transfer to a low (170 F) oven and cover with foil if they begin to darken. Combine ingredients in a blender or food processor until smooth, then season with salt and pepper to taste. Thin dressing to desired consistency with more water. Keeps for nearly a week in the refrigerator. Toss lentils, romaine, scallions, and cucumber with plenty of dressing to coat. 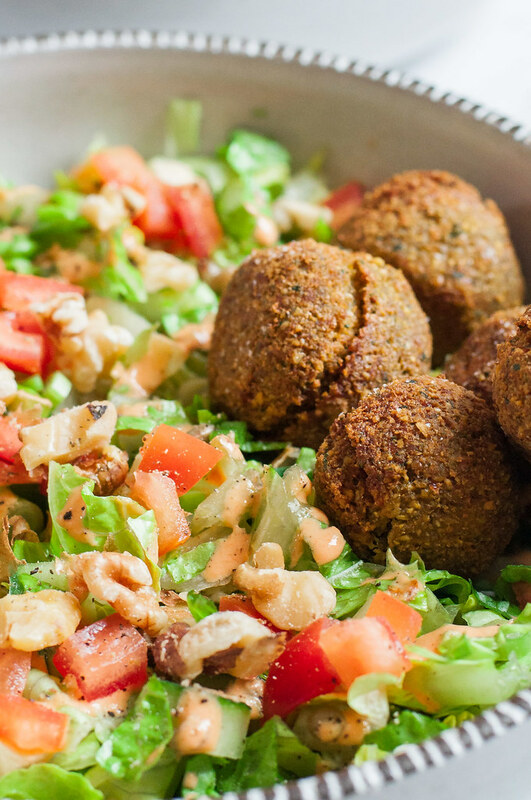 Top with tomatoes and walnuts, and serve each individual portion with three to six mini falafel. Although the shallow fry is much safer than deep frying at home, please be careful! A high temp thermometer is highly encouraged to help keep your oil from getting too hot and posing a fire hazard. It will also ensure that you avoid oily falafel which result from frying at too low a temperature. You could certainly soak more chickpeas than needed, proceeding to cook the extra and freeze or refrigerate them for later. If you do so, you'll need 3 cups of chickpeas that have soaked 12 to 24 hours for the falafel. For a little extra red pepper flavor in the dressing, add a tablespoon of the juices that gather when you peel and seed a homemade roasted bell pepper. I boil my lentils with a bay leaf, a smashed garlic clove, a generous pinch of salt, and a few big chunks of onion or celery, if I have them on hand. They're extra flavorful that way! Falafel recipe adapted from Joy of Cooking. this salad looks incredible! It funny becuase a year ago I couldn’t even pronounce the word falafel, but now Im a snob too! Thanks Bethany! 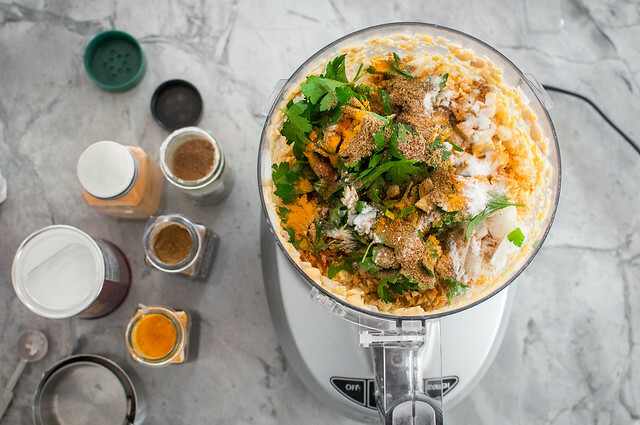 It’s so strange–who knows what foods we’ll be obsessed with a couple years from now. Thanks Sarah! Totally agree with you.